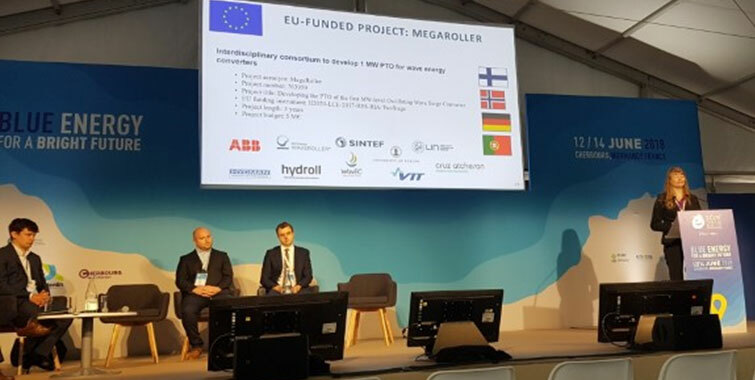 Members of the MegaRoller consortium participated in the The International Conference on Ocean Energy (ICOE) in Cherbourg, France from June 12-14th 2018. The conference is a global marine energy event focused on the industrial development of renewable marine energy. Held every two years, the goal of the conference and exhibition is to share recent experiences from research and demonstration efforts. It aims to accelerate development by stimulating collaboration networks between companies and research and development centres. The conference lasted for 2,5 days and had various technical and semi-commercial presentations in relation to wave- and tidal energy. In addition, there was a exhibition from international and French exhibitors. MegaRoller coordinator Tuula Mäki held a presentation on Tuesday 13th June. She of course used the opportunity to inform the industry and Wave Energy community about the newly launched MegaRoller project. The presentation by Tuula and representatives from 3 other flagship projects was followed by a very interesting panel debate. Well done, Tuula! Tuula presenting at the ICOE 2018 in Cherbourg, France (Normandie). Right: Early morning overview of the poster area with the exhibition in the background. Left: It takes concentration and preparations to be a presenter at an international conference! Opening of a session with Matthijs Soede and a following panel debate. The next conference in the ICOE series will be in Washington in 2020.